Background: Physiological and Operative Severity Score for the Enumeration of Mortality and Morbidity (POSSUM) is a validated instrument used to predict morbidity. The aim of our study was to evaluate the performance of the POSSUM score system on predicting perioperative frailty and quality of life (QOL) in elderly surgical patients. Patients and Methods: An observational prospective study was conducted during 3 months. POSSUM was used to determine operative morbidity risk. 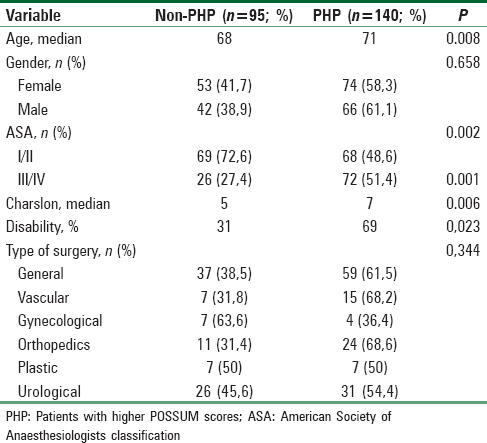 Patients with a POSSUM score ≥26 were considered as having a high POSSUM (PHP). WHODAS 2.0, EuroQOL-5 dimensions (EQ-5D), Charlson score, and the Clinical Frailty Scale were used to assess the QOL and frailty. Chi-square, Fisher's exact, or Mann–Whitney tests were used for comparisons. Results: Two hundred and thirty-five patients were included. Median age was 69 years; 58% were ASA I/II and 42% ASA III/IV. Frailty was present in 53 patients (23%). Median POSSUM score was 26. Patients PHP were older (median age 71 vs. 68, P = 0.008), more frequently ASA III/IV (P = 0.001), had higher median Charlson scores (7 vs. 5, P = 0.006) and were more frail (49% vs. 26%, P < 0.001). PHP presented more problems in EQ-5D dimensions preoperatively (mobility: 59% vs 41%, P = 0.008; care: 41% vs. 25%, P = 0.013; activity: 52% vs. 32%, P = 0.002; pain: 59% vs. 45%, P = 0.041) but not anxiety (P = 0.137). Three months after surgery, PHP patients presented more problems in mobility: 63% vs. 38%, P < 0.001; care: 48% vs. 31%, P = 0.009; activity: 58% vs. 44%, P = 0.036; pain 59% vs. 37%, P = 0.001 and anxiety: 54% vs. 50%, P = 0.025. Conclusions: Patients PHP were frailer and had worse perioperative QOL. Due to the growing proportion of elderly population, there is an increasing prevalence of older patients in the perioperative setting., Thus, more and more surgical procedures are being performed on patients with multiple morbidities and progressive functional decline, a reality which might not be adequately evaluated by the general perioperative risk assessment measures. Our study aimed to evaluate the correlation between Physiological and Operative Severity Score for the Enumeration of Mortality and Morbidity (POSSUM) with perioperative quality of life (QOL), frailty, and other related outcomes in a population of elderly patients. The current prospective observational study was conducted for 3 months at a University Hospital after obtaining approval by the ethics institutional committee. All participants signed the informed consent after being properly informed about the purpose, procedures, and expected duration of the study. Patients were considered to be old if they were over 60 years old. Two hundred and thirty-five old patients scheduled to undergo elective procedures under general, regional, or combined anesthesia for general, urological, gynecological, plastic, vascular, or orthopedic surgeries were enrolled in the study. Patients who were (i) admitted to the intensive care unit (ICU) immediately after surgery, (ii) submitted to emergency or urgent surgery procedures, (iii) unable to speak or understand the Portuguese language, or (iv) incapable of signing the informed consent were excluded from the present study. This selection was carried out up to 14 days before the day of the surgery. Data collected at the preoperative visit (T0) included physical status classification of the American Society of Anaesthesiologists (ASA), the validated Portuguese version of EQ-5D-5L questionnaire, for health-related QOL assessment, the WHO Disability Assessment Schedule 2.0 (WHODAS 2.0), the Charlson Index, and the Clinical Frailty Scale. Patients were classified as disable if their score was above 25% in the WHODAS scale and as frail if they scored ≥5 on the Clinical Frailty Scale. The Physiological and Operative Severity Score for the enUmeration of Mortality and Morbidity (P-POSSUM) proposed by Prytherch et al. was used to determine mortality. The intraoperative parameters required for the Operative Severity part of the POSSUM score were obtained through surgical records. Patients having POSSUM scores higher than the median of the considered population were considered as having high POSSUM (PHP). Postoperative disability and reintervention rates were evaluated at 30 days (T1) and quality of life and frailty at 3 months of (T3) follow-up. Patient-reported QOL was evaluated through the Portuguese version of the EQ-5D-5L questionnaire at T3 and compared with the results registered at T0 through Chi-square testing. Patients having any grade of problems in a particular dimension were considered to have problems in that dimension. Chi-square, Fisher's exact, or Mann–Whitney tests were used for comparisons. A P value <0.05 was considered significant. All statistical analyses were performed using SPSS 22.0. At the baseline, 244 patients were eligible for the study. Of these, six were excluded for lack of data, making up a final cohort of 235 patients. The median age was 69 years old, with ages ranging from 60 to 91 years. The median Charslon score was 6, and the preoperative frailty was present in 53 patients (23%). Fifty-eight percent (n = 136) of the patients were ASA I or II; 42% (n = 98) were ASA III or IV. As the median POSSUM score was 26, patients with POSSUM scores ≥26 were considered as having high POSSUM (PHP). Of the total 235 patients, 140 were PHP (60%). Both the demographic profile and the type of surgical procedures are summarized in [Table 1]. PHP were frailer at T0 [Table 2]. In-hospital mortality was 2.6% (n = 6) and 30-day (T1) mortality was 3.8% (n = 9). P-POSSUM predicted mortality was 3.0% (n = 7). There was no significant difference between P-POSSUM predicted and observed in-hospital and 30-day mortality (P = 1.0). Patients who died in the hospital had similar POSSUM scores (29 vs. 26, P = 0.464). The AUROC of P-POSSUM was 0.563 for 30-day mortality. The remaining patients were assessed for postoperative disability, frailty, and QOL. In all cases, the comparison of EQ-5D-5L questionnaire at T0 vs. T3 revealed a deterioration in the QOL after surgery. This worsening was manifested in all the categories: mobility (19% vs. 80%, P < 0.001), care (11% vs. 69%, P < 0.001), activity (16% vs. 69%, P < 0.001), pain (30% vs. 77%, P < 0.001) and anxiety (46% vs. 87%, P < 0.001). The prevalence of frailty increased at T3 vs. T0 (70% vs. 39%). When comparing the two groups, PHP patients had more disability at T1 (52% vs. 35%, P = 0.010) [Table 3] and a prolonged median length of hospital stay (6 vs. 4 days, P = 0.027). Rate of reinterventions was also higher for PHP patients at T1 [Table 4]. PHP presented more problems in almost all EQ-5D dimensions at T0 and T3 [Table 5] and [Table 6]. PHP were associated with a lower prevalence of frailty at T3 (65% vs. 83%, P < 0,001). Like the POSSUM system, the vast majority of surgery-related scoring systems are designed to predict postoperative mortality, which remains the most commonly assessed outcome. In fact, the main purpose of POSSUM is to provide a numerical prediction of 30-day morbidity and mortality rates, considering both the physiological status of the patient and intraoperative information. However, patients can have other significant concerns regarding the surgical intervention, such as the postoperative quality of recovery, length of hospital stay, functional capacity, or QOL., Although the POSSUM system has been validated to assess and compare surgery-related morbidity and mortality, there is a lack of research regarding its capacity to foresee these highly-valued patient goals. Closely interrelated with frailty and increasing with age is the state of disability., When assessing this parameter, we observed more disability in PHP patients, both in the pre and postoperative period. This had already been verified by Amemiya et al. in patients after elective surgery for gastric and colorectal cancers. POSSUM was found to be useful in predicting protracted disability, measured by the Katz index. McGirt et al.recently concluded that, among other indicators, both age and higher ASA scores could be predictors of disability after lumbar spine surgery. As expected, the PHP had higher Charslon scores, older age and higher rates of reintervention. In a previous report of patients over 70 years old after noncardiac surgery, these indicators (comorbidities, age, and new hospitalization after discharge) were found to be the most important independent predictors for long-term QOL and functional status. Our rate of reintervention at T1 was 6% (n = 15), higher than described in literature, which can be explained by the inclusion of a wider range of surgical specialties in our study. Howes et al. showed that ASA score and POSSUM were positively correlated with prolonged length of stay following emergency laparotomy, which is consistent with the results of this study. Longer initial hospital stay and early readmission have also been previously associated with reduced long-term functional recovery. QOL is becoming an important method to evaluate outcomes after surgery, particularly in the elderly population., Health-related quality of life (HRQOL) can be defined as the perceived functional effect of a medical status (both physical and mental) on a given individual. Several methods have been proposed and used to evaluate HRQOL, given its multidimensional aspects and their intrinsic subjectivity., However, despite the increasing relevance given to these measures, there is still a lack of predictive models to assist decision-making in the perioperative setting. Ideally, the assessment of postoperative patient-centered outcomes in daily clinical practice should always include a comparison with the patient's own preoperative status, whereas standard threshold population values should be used only in exceptional cases of absence of baseline patient data., The EQ-5D-5L is a validated, revised version of the EuroQoL-5D scale and is currently the most widely used instrument of patient-reported outcome assessment., It inquires patients on problems in five dimensions of health – mobility, self-care, usual activities, pain/discomfort, and anxiety/depression. This scale has already been proved an useful and reliable measure in a wide range of medical conditions and interventions, and its inclusion in the standard perioperative outcome assessment should be considered. Our study showed a worsening of QOL in elderly patients 3 months after surgery (T3). Literature results diverge on this matter. In line with our findings, Maillard et al. observed a postoperative decrease of HRQOL 30 days after major surgery. Fierens et al., however, showed no significant improvement in QOL in the elderly submitted to hip fracture surgery. In contrast, Rønning et al. evaluated QOL in elderly patients 3 months after surgery for colorectal cancer and concluded that QOL may be improved, even in frail patients. Mangione et al. also observed a sustained gain of QOL at 6 and 12 months after surgery in patients over 50 years old. The diverging findings between this study and ours may result from the fact that, 3 months after the procedure, patients might still be recovering from the surgical stress and the potential improvement in QOL may not be yet perceived. Available data on this subject suggests this recovery process might be longer and more eventful in the elderly population, considering the higher prevalence of frailty and disability.,,,,, We assessed the patients' QOL after 3 months with the main intent of limiting the dropout rate, and because this time mark is commonly used when assessing this parameter. Comparison of perioperative changes in HRQOL may be impaired by the different time frames and questionnaires used in the literature for assessing the outcome. The different types and extent of surgical procedures considered in the literature might also limit comparison. We included a wide range of surgeries to offer stronger support for the generalization of our findings to several surgical settings. As the POSSUM score contains intraoperative information, the differences between the procedures were included in perioperative risk determination. Postoperative morbidity has been suggested to be a source of anxiety among patients, and anxiety represents a critical dimension of self-perceived postoperative quality of life. We found that rates of anxiety-related problems were not higher for PHP at T0, whereas at T3 those rates were significantly higher in the PHP group of patients, according to literature findings. However, the number of studies addressing the correlation between morbidity and patient-reported quality of life is unexpectedly low, given the increasing proportion of patients with multiple morbidities, typically represented by the elderly population. PHP had poorer quality of life, supporting our hypothesis that POSSUM score is associated with QOL outcomes in the elderly after elective surgery. In fact, the postoperative morbidity predicted by POSSUM scores translated into lower quality of life scores in elderly patients. To our knowledge, this was the first study to suggest this association, as we found no previous evidence in the literature on this issue. Our study has some limitations. First, the selection of a cohort of patients over 60 led to the analysis of a higher-risk group in itself. Moreover, there is still no consensus in the literature concerning the definition of “older age,” which remains somewhat arbitrary and prevents an accurate interpretation and comparison of studies' results. The sample was also relatively small, and, consequently, β errors may be the reason for the lack of statistical significance in some endpoints. In addition, surgical risk stratification was not conducted. In fact, higher risk could be associated with surgery and not with the patient itself. Our conclusions suggest the POSSUM score, currently applied almost exclusively as an indicator of postoperative morbimortality, could potentially be a tool in the determination of which patients may profit from a more comprehensive physical and mental care in the perioperative period. World Health Organization. Proceedings of the WHO Global Forum on Innovations for Ageing Populations; 2013 Dec 10-12; Kobe, Japan. World Health Organization; 2014. Guerra M, Abelha F. Anesthesia in the elderly. Rev Soc Port Anestesiol 2016;25:32-4. Marengoni A, Angleman S, Melis R, Mangialasche F, Karp A, Garmen A, et al. Ageing with multimorbidity: A systematic review of the literature. Ageing Res Rev 2011;10:430-9. McGory ML, Kao KK, Shekelle PG, Rubenstein LZ, Leonardi MJ, Parikh JA, et al. Developing quality indicators for elderly surgical patients. Ann Surg 2009;250:338-47. Ferreira LN, Ferreira PL, Pereira LN, Oppe M. The valuation of the EQ-5D in Portugal. Qual Life Res 2014;23:413-23. Ferreira LN, Ferreira PL, Pereira LN, Oppe M. EQ-5D Portuguese population norms. Qual Life Res 2014;23:425-30. Prytherch DR, Whiteley MS, Higgins B, Weaver PC, Prout WG, Powell SJ. POSSUM and Portsmouth POSSUM for predicting mortality. Physiological and Operative Severity Score for the enUmeration of Mortality and morbidity. Br J Surg 1998;85:1217-20. Rix TE, Bates T. Pre-operative risk scores for the prediction of outcome in elderly people who require emergency surgery. World J Emerg Surg 2007;2:16. Copeland GP, Jones D, Walters M. POSSUM: A scoring system for surgical audit. Br J Surg 1991;78:355-60. Mangione CM, Goldman L, Orav EJ, Marcantonio ER, Pedan A, Ludwig LE, et al. Health-related quality of life after elective surgery: Measurement of longitudinal changes. J Gen Intern Med 1997;12:686-97. Kristjansson SR, Nesbakken A, Jordhoy MS, Skovlund E, Audisio RA, Johannessen HO, et al. Comprehensive geriatric assessment can predict complications in elderly patients after elective surgery for colorectal cancer: A prospective observational cohort study. Crit Rev Oncol Hematol 2010;76:208-17. Wolff J, Starfield B, Anderson G. Prevalence, expenditures, and complications of multiple chronic conditions in the elderly. Arch Intern Med 2002;162:2269-76. Kadam U, Croft P. Clinical multimorbidity and physical function in older adults: A record and health status linkage study in general practice. Fam Pract 2007;24:412-9. Gijsen R, Hoeymans N, Schellevis F, Ruwaard D, Satariano W, van den Bos G. Causes and consequences of comorbidity: A review. J Clin Epidemiol 2001;54:661-74. Michelson H, Bolund C, Brandberg Y. Multiple chronic health problems are negatively associated with health related quality of life (HRQOL) irrespective of age. Qual Life Res 2000;9:1093-104. Grimby A, Svanborg A. Morbidity and health-related quality of life among ambulant elderly citizens. Aging (Milano) 1997;9:356-64. Fortin M, Lapointe L, Hudon C, Vanasse A, Ntetu A, Maltais D. Multimorbidity and quality of life in primary care: A systematic review. Health Qual Life Outcomes 2004;2:51. Crilly M, Johnston M, Black C. Relationship of EQ-5D quality of life with the presence of co-morbidity and extra-articular features in patients with rheumatoid arthritis. Qual Life Res 2014;23:1435-43. Saxton A, Velanovich V. Preoperative frailty and quality of life as predictors of postoperative complications. Ann Surg 2011;253(6):1223-9. Makary MA, Segev DL, Pronovost PJ, Syin D, Bandeen-Roche K, Patel P, et al. Frailty as a predictor of surgical outcomes in older patients. J Am Coll Surg 2010;210:901-8. McGuckin DG, Mufti S, Turner DJ, Bond C, Moonesinghe SR. The association of peri-operative scores, including frailty, withoutcomes after unscheduled surgery. Anaesthesia 2018;73:819-24. Tan KY, Kawamura YJ, Tokomitsu A, Tang T. Assessment for frailty is useful for predicting morbidity in elderly patients undergoing colorectal cancer resection whose comorbidities are already optimized. Am J Surg 2012;204:139-43. Shulman MA, Myles PS, Chan MT, McIlroy DR, Wallace S, Ponsford J. Measurement of disability-free survival after surgery. Anesthesiology 2015;122:524-36. Amemiya T, Oda K, Ando M, Kawamura T, Kitagawa Y, Okawa Y, et al. Activities of daily living and quality of life of elderly patients after elective surgery for gastric and colorectal cancers. Ann Surg 2007;246:222-8. Brorsson B, Asberg KH. Katz index of independence in ADL. Reliability and validity in short-term care. Scand J Rehabil Med 1984;16:125-32. McGirt MJ, Bydon M, Archer KR, Devin CJ, Chotai S, Parker SL, et al. An analysis from the Quality Outcomes Database, Part 1. Disability, quality of life, and pain outcomes following lumbar spine surgery: Predicting likely individual patient outcomes for shared decision-making. J Neurosurg Spine 2017;27:357-69. Manku K, Leung JM. Prognostic Significance of Postoperative In-Hospital Complications in Elderly Patients. II. Long-Term Quality of Life. Anesth Analg 2003;96:590-4. González-Martínez S, Martín-Baranera M, Martí-Saurí I, Borrell-Grau N, Pueyo-Zurdo JM. Comparison of the risk prediction systems POSSUM and P-POSSUM with the Surgical Risk Scale: A prospective cohort study of 721 patients. Int J Surg 2016;29:19-24. Bowyer A, Royse C. The importance of postoperative quality of recovery: Influences, assessment, and clinical and prognostic implications. Can J Anaesth 2016;63:176-83. DR. U. Measuring quality of life after surgery. Surg Innov 2005;12:161-5. McSweeny AJ, Creer TL. Health-related quality-of-life assessment in medical care. Dis Mon 1995;41:1-71. Devlin NJ, Shah KK, Feng Y, Mulhern B, van Hout B. Valuing health-related quality of life: An EQ-5D-5L value set for England. Health Econ 2017;27:7-22. Bowyer A, Royse C. The future of postoperative quality of recovery assessment: Multidimensional, dichotomous, and directed to individualize care to patients after surgery. Curr Opin Anaesthesiol 2016;29:683-90. Fayers P, Machin D. Quality of Life - The assessment, analysis and reporting of patient-reported outcomes. 3rd ed. Wiley-Blackwell; 2016. Herdman M, Gudex C, Lloyd A, Janssen M, Kind P, Parkin D, et al. Development and preliminary testing of the new five-level version of EQ-5D (EQ-5D-5L). Qual Life Res 2011;20:1727-36. Maillard J, Elia N, Haller CS, Delhumeau C, Walder B. Preoperative and early postoperative quality of life after major surgery - a prospective observational study. Health Qual Life Outcomes 2015;13:12. Fierens J, Broos PL. Quality of life after hip fracture surgery in the elderly. Acta Chir Belg 2006;106:393-6. Rønning B, Wyller TB, Nesbakken A, Skovlund E, Jordhøy MS, Bakka A, et al. Quality of life in older and frail patients after surgery for colorectal cancer-A follow-up study. J Geriatr Oncol 2016;7:195-200. Simon CB, Riley JL, Coronado RA, Valencia C, Wright TW, Moser MW, et al. Older Age as a Prognostic Factor of Attenuated Pain Recovery After Shoulder Arthroscopy. PM R 2016;8:297-304. Mazzoli D, Giannotti E, Longhi M, Prati P, Masiero S, Merlo A. Age explains limited hip extension recovery at one year from total hip arthroplasty. Clin Biomech (Bristol, Avon) 2017;48:35-41. Lawrence VA, Hazuda HP, Cornell JE, Pederson T, Bradshaw PT, Mulrow CD, et al. Functional independence after major abdominal surgery in the elderly. J Am Coll Surg 2004;199:762-72. Deiner S, Silverstein JH. Long-term outcomes in elderly surgical patients. Mt Sinai J Med 2012;79:95-106. Ortiz-Alonso FJ, Vidán-Astiz M, Alonso-Armesto M, Toledano-Iglesias M, Alvarez-Nebreda L, Brañas-Baztan F, et al. The pattern of recovery of ambulation after hip fracture differs with age in elderly patients. J Gerontol A Biol Sci Med Sci 2012;67:690-7. Aerts PD, de Vries J, van der Steeg AF, Roukema JA. The relationship between morbidity after axillary surgery and long-term quality of life in breast cancer patients: The role of anxiety. Eur J Surg Oncol 2011;37:344-9.